Distrust of vaccines may be almost as contagious as measles, according to medical anthropologist Elisa Sobo. More than 100 people have been infected with measles this year, according to the Centers for Disease Control. Over 50 of those cases have occurred in southwest Washington state and northwest Oregon in an outbreak that led Washington Gov. Jay Inslee to declare a state of emergency on Jan. 25. Some public health officials blame the surge of cases on low vaccination rates for this highly infectious disease. Clark County, Wash. — the center of the current spate of cases — has an overall vaccination rate of 78 percent, but some schools in the county have rates lower than 40 percent. Washington is one of 17 states that allows a parent to send his or her child to public school not completely vaccinated because of a "philosophical or personal objection to the immunization of the child." What makes some families reluctant to vaccinate their children? 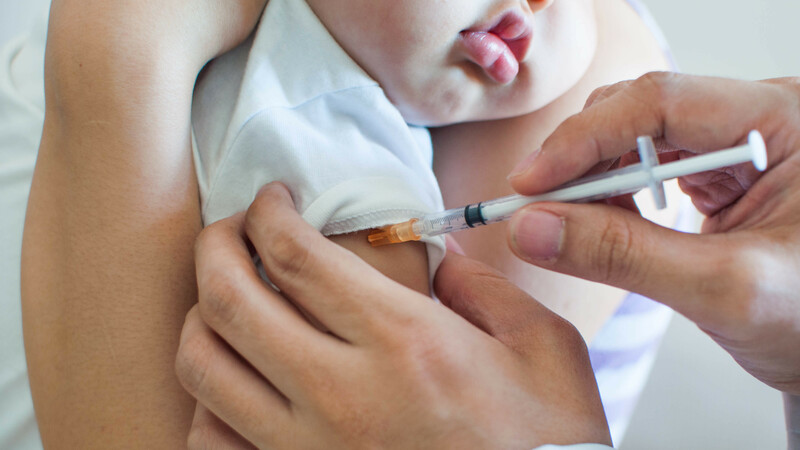 Sobo, a professor at San Diego State University, says it may be driven in part by the desire to conform in a community where many parents are skeptical of vaccines. To better understand how parents decide not to vaccinate, Sobo interviewed families at a school with low vaccination rates in California. She found that skepticism of vaccines was "socially cultivated." Parents who believe that vaccines are dangerous persuaded other parents to believe the same thing by citing fears of "mainstream medicine" harming their children. Enrolling in the school even seemed to change the beliefs of some parents who had previously followed the state-mandated vaccine schedule: They started to refuse vaccines. NPR's Audie Cornish spoke with Sobo on All Things Considered. These interview highlights have been edited for clarity and length. What are the common ideas that we have about families that don't believe in vaccination? One common idea would be that they're all absolutely looney-tunes, crazy people wearing tinfoil hats and reading all these conspiracy theories on crazy blogs on the Internet. And that is absolutely not the case. What I found was that most of the people who are hesitating to vaccinate ... They're really smart people, and they're highly, highly educated. Back in 2012, you actually spoke to some parents in California, in a community where parents had their kids at a fairly progressive school. Half of kindergarteners had gotten exemptions from vaccines. What was going on in this community? Often, the parents, the family didn't arrive at the school having any hesitancy about vaccinations ... As they acculturated or became part of the community, that's when these kinds of beliefs and practices would take hold. The longer the family had been in the community, ... this practice of being hesitant about vaccinations evolved and it became part of that family's medical practice. [In areas where there are low vaccination rates], there tends to be a more open norm, where not vaccinating is accepted or sometimes even encouraged. When you have people surrounding you that move in that direction, to go in a different direction has social costs. It's not just the facts and the information that you're going by. It's: "What are the norms? What are people around me doing? And they seem to be OK, and everything's working out for them." Think about yourself and the clothes that you wear to work. I'm guessing that you probably don't have a formal dress code, but you kind of look around, and you see: "Oh, OK, this is what we're expected to wear to work." And you just do it. Are you talking about a formal kind of peer pressure? The peer pressure is not formal. Informally, there becomes a sort of feeling in the community. It becomes known for not vaccinating. There are parts of the country where there's the opposite expectation, where someone who didn't want to vaccinate their kids might be socially isolated for that decision. And then their behaviors would be pushed underground. They might not feel comfortable telling other people. When you see what's going on in Washington State, what came to mind for you? What is the media coverage going to do? Are they going to vilify these parents? That witch hunt aspect is not helpful to have a good discussion about vaccination. It needs to be much more open and much less polarizing. Are people ready to listen? Can there be convincing? I think people are very ready to listen — if they're heard. If you listen to them, and you allow them to say what they think without feeling judged, without pushing them into a corner, they're absolutely ready. Mara Gordon is a family physician in Washington, D.C., and a health and media fellow at NPR and Georgetown University School of Medicine.